Allows you to monitor the status of your generator from anywhere in the world using a smartphone, tablet, or PC. Easily access information, such as the current operating status and maintenance alerts. With Mobile Link, you are taken care of before the next power outage. Don't worry about having to be there to start and turn off your Generac home backup generator because it does that automatically--whether you're home or away. Generac created the home backup generator category. Today, our generators are preferred by most homeowners who invest in home backup power. You'll never have to run an extension cord through a window or door again. Your Generac home backup generator safely delivers power right to your home's electrical panel. Power outages aren't a 9-to-5 thing. That's why we're standing by all day every day from our headquarters in Wisconsin to answer any questions you might have. A Generac home backup generator senses a power outage, turns on automatically, and delivers backup power to your home. It will run until utility power returns - whether that's in two hours or two weeks. Home Backup Generators: What Do I Need to Know? We know a home backup generator is a big investment. Here's what you need to know to make an informed decision about your Generac home backup generator purchase. How Do I Choose the Right Generator for Me? Generac has an online sizing calculator that can help you determine the right home backup generator for your unique needs. The best way, though, is to work with one of our 5000 dealers. They'll help you select the right generator, and provide you with a free, in-home assessment. What's Involved in Installing a Home Backup Generator? Installing a home backup generator is an exciting time. Your installer will prepare the installation site outside your home, place the generator, run the natural gas or LP fuel line, install the transfer switch, and make all of the necessary electrical connections. And they will make sure that your backup generator runs properly, and is ready for its first power outage. Generac home backup generators start at $1,949--the most cost-effective on the market. Installation costs vary by system size, installation considerations, and local building codes. We recommend getting a free, in-home assessment from a Generac dealer near you. You can begin exploring the full selection of Generac home backup generators. Use our interactive sizing guide to narrow down the selection. Then contact a Generac dealer for a free, in-home assessment. And if you have any questions, you can chat with a Generac representative. Interested in purchasing an automatic home standby generator? Get started today by downloading Generac’s FREE Buyer’s Guide! Get expert advice and tips to choose the right generator to protect your home, and learn more about the installation process. With a few clicks of the mouse, our easy-to-use generator sizing calculator will recommend a range of generators that fit your needs. Generac also offers a wide range of 50Hz home backup options. Find the right one to match your needs. Generac offers a variety of financing options for your home generator system purchase. Click the button below to find out more! 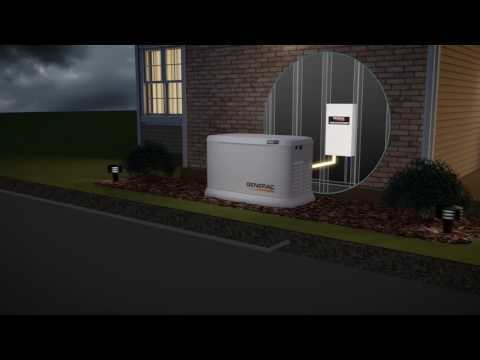 Learn more about how Generac home backup generators work, and hear from Real Generac Owners. How Does a Home Backup Generator Help Me? There are a lot of choices out there for backup power. Find out how a Generac home backup generator can help you during a power outage. Mary Lou of Pennsylvania feels safe and comfortable in her home now that she has a Generac automatic standby generator. After returning home from a vacation with his family, Rich L. learned that a storm had knocked out the power. His home had significant damages. That won't happen again, now that Rich has an automatic standby generator. Have You Seen Our Infomercial? Airing nationwide, Generac's infomercial explains why homeowners need a source of automatic backup power. And it highlights some special offers you can take advantage of if you act now to buy and install a Generac automatic home backup generator.